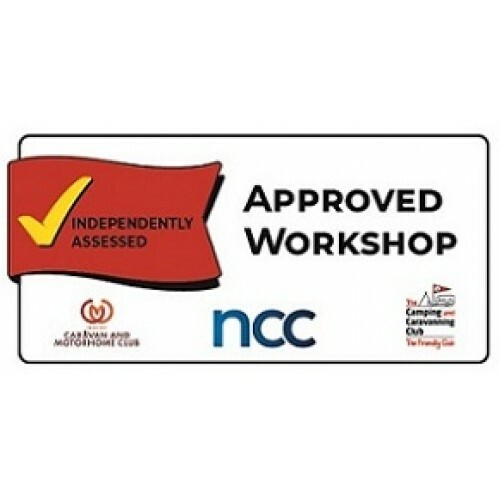 We are an approved workshop which is collaboration by the National Caravan Council, The Caravan and Motorhome Club and The Camping and Caravanning Club has resulted in the creation of the Approved Workshop Scheme (AWS). 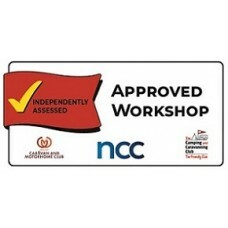 To be part of the scheme requires workshop to pass a rigorous annual inspection carried out by an independent inspector, and to comply with strict standards. The technicians must have formal qualifications and comply with the industry’s code of practice. With this in mind, the customer (you) will have peace of mind that the work is carried out to a high standard A basic service can cover about 50 individual jobs, generally divided into the following areas. All internal and external lights are assessed to see if there are any faults. Sockets are tested using a loop check, which sends a signal down to verify that it is wired correctly. Included in these checks are fridge operation, the consumer unit, the TV socket, the battery and anything that requires electricity. A residual current device (RCD) check involves making sure the RCD trips within a set time. In addition, the miniature circuit breakers are checked to ensure that they are correct for the appliances in the vehicle. A manometer is used to check for leaks in the gas supply system. All gas appliances – such as the oven, the fridge, the heating system and the water heater – are turned on, to check they are working properly. All vents are checked to see they are clear. Then all appliances are turned off at the gas isolator taps. The flame-failure device should cut in, meaning the test has been passed. All taps are individually checked for leaks, and the motorhome’s waste-water outlet is observed for blockages. The toilet is inspected to ensure the valve seal is well lubricated and the battery-operated flush is working. All doors, windows and blinds are assessed for smooth operation. General observations are made of the whole bodywork, including a visual inspection of the roof. A damp check is carried out around the inside of the motorhome – a reading of 0-15% means there no concerns, but 15-20% requires further investigation and a recheck within three months. If the reading is above 20%, immediate attention is required because this highlights an area of water ingress. A damp report will be given on completion of the service. All the motorhome’s rooflights are opened and closed to ensure that they operate properly. In addition, all fixed vents are checked for possible obstructions. The smoke alarm and CO detector are tested and checked to see they are not past their replacement date. If you carry a fire extinguisher, the expiry date is checked. If you carry a fire blanket, the housing unit is inspected to ensure that it is secure. With all of the appliances found in motorhomes today, it is more important than ever to get a regular habitation service, to ensure everything is in good working order and that your ’van is safe on the road, as well as habitable. Sophisticated equipment requires sophisticated tools to check it, so by using an AWS workshop you can head off on your holidays safe in the knowledge that your motorhome has been serviced by a highly qualified, competent technician. Self-build campervans and motorhomes built before 2004, please contact us for a price, as they dont fall into a standard service.